Chronic pain is a common cause of physical and emotional suffering, disability and inability to work. Option to treat neck, back, arm or leg pain for decades. Spinal cord stimulation has been an option to treat chronic neck, back, arm or leg pain for decades. Previously only an option for patients who had already tried surgery without relief, spinal cord stimulation can now be an option even as initial surgical treatment. It can treat most types of pain from various causes, but it historically is used for neuropathic pain. Spinal cord stimulation is only performed after patients have tried conservative options like medications, exercise, therapy and even injections in some cases. 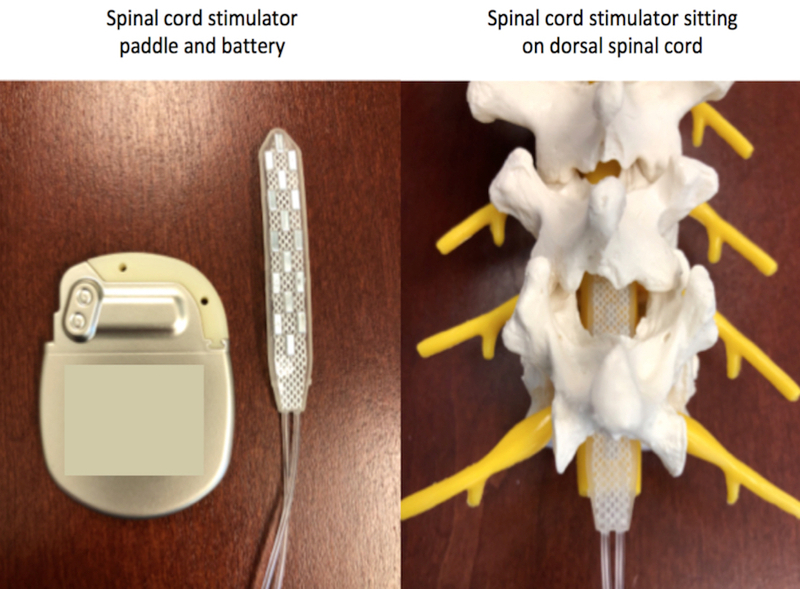 A spinal cord stimulator is laid on the back (dorsal) side of the spinal cord. For neck pain, a spinal cord stimulator is usually placed around C2 or C3. For low back pain, the stimulator is often placed around the T8 or T9 levels. For leg pain, the stimulator is often placed around T10. The spinal cord stimulator seems to work by what is called the “gate control theory” of pain. Newer research suggests the electrical field created also activates nerves which improves pain. 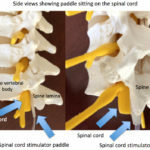 Regardless of the mechanism, the spinal cord stimulator essentially blocks the pain signals from reaching the brain, so the pain is perceived as less intense. Spinal cord stimulation usually does not completely resolve pain, but more often makes it tolerable. It is important to remember that spinal cord stimulation, in its common usage, only treats pain. It does not affect weakness or numbness. Recent research has studied spinal cord stimulators in the lower lumbar spine to treat spinal cord injuries, but that is still investigational. We do not perform this type of stimulation at Rocky Mountain Brain & Spine Institute. 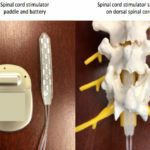 One of the greatest advantages to trying a spinal cord stimulator is that a trial is first performed. Usually an outpatient procedure performed by a pain specialist (not us at Rocky Mountain Brain & Spine Institute), electrodes are placed and connected outside the skin to a battery pack. Over the next few days, a pain diary is kept. If pain medication usage diminishes and the pain is improved by more than 50%, then a permanent implant can be pursued. 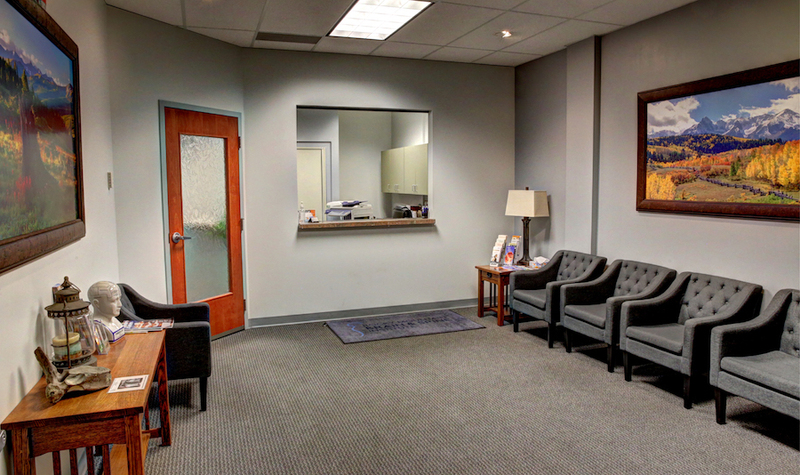 Prior to permanent implantation, a neuropsychiatric evaluation is mandated by insurance companies. This is not meant to imply that patients are “crazy” or have psychiatric problems. However many patients with pain have depression, anxiety and poor coping which can limit the effectiveness of the device. This screening both helps patients prepare for the spinal cord stimulator and identifies some patients that may not respond as well. If it is decided to pursue a spinal cord stimulation, Rocky Mountain Brain & Spine Institute can place the permanent implant. This usually is a paddle (larger than the electrodes used in the trial). 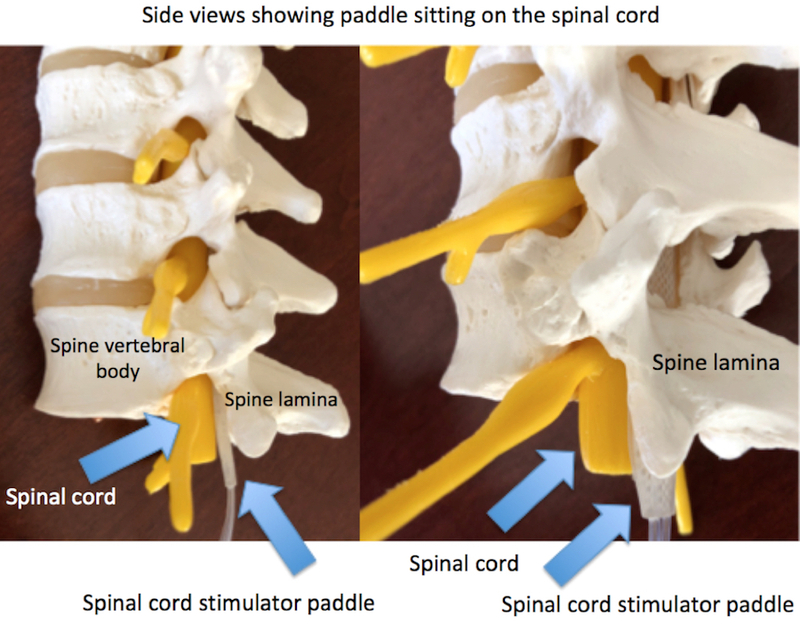 A laminectomy is performed and the paddle is placed over the spinal cord. The wires are then connected to a battery which usually sits in the buttock. The permanent spinal cord stimulation procedure can be performed as an outpatient procedure, but some patients are observed over night. Some patients can even undergo the procedure awake, with some sedation. 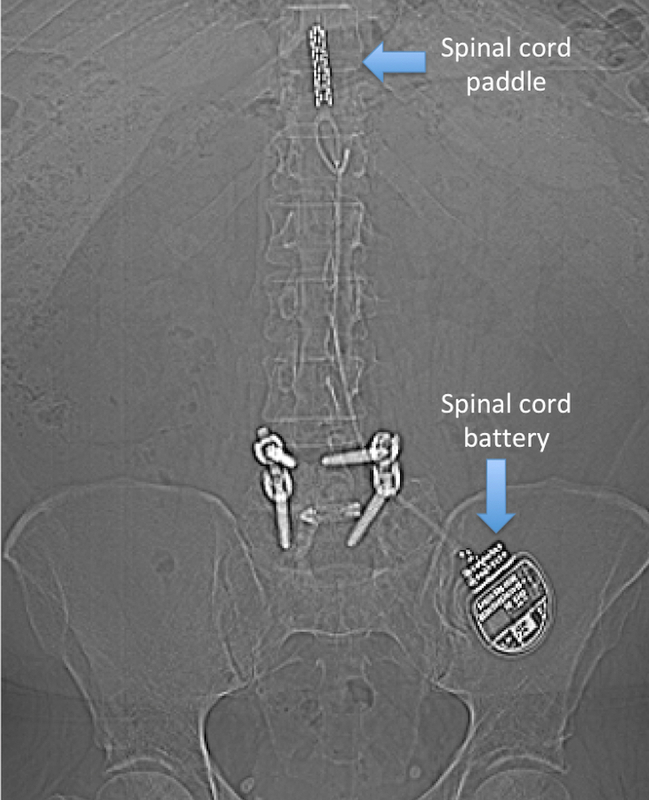 The spinal cord stimulator battery will eventually need to be replaced ever 6-10 years. There are rechargeable versions, but even these eventually require replacement, which is a repeat outpatient surgery. Spinal cord stimulators now can be MRI compatible. If you have questions about spinal cord stimulation, contact our BOARD CERTIFIED spine surgeon at Rocky Mountain Brain & Spine Institute.